So here I sit, thinking of you, a bit distracted by everything going on around me, but never without you in my heart. There are so many things blooming before my eyes, moments and thoughts and memories, that I don't want to miss. I search for words that I can share, because according to poet, Naomi Shihab Nye, "Words will have a bigger life if you share them." So here I sit, thinking and watching for all the glorious moments that present themselves before me. The beauty of the very simplest things in life distract and fill me...calming of candlelight, the idea of poems stuck inside linen pockets, birds at my feeders, good reads, quotes, daydreams, landscapes, small little objects handsewn into beautiful images of children's dresses, purposeful pauses, hand-sculpted animals that suggest tenderness and sensibility, and words, everywhere, that describe an awareness of seeing and listening . I love "Tuesdays" because of the wonderfully talented and inspiring women who show up. Pages in my journals fill up, like life on a busy day, sometimes more quickly than I can process. If I am lucky, I can return to them to reflect. Naomi Shihab Nye is a poet who celebrates life in the simple everyday occurrences. On Being host, Krista Tippett, interviews Nye for the podcast, Your Life is a Poem. Nye says, "I have always loved the gaps, the spaces between things as much as the things. I love staring, pondering, mulling, puttering. I love the times when someone or something is late - there's that rich possibility of noticing more, in the meantime...poetry calls us to pause. There is so much we overlook, while the abundance around us continues to shimmer, on its own." Drawing small panoramic sketches may be a way to capture quick snippets of the tender moments that fill the gaps and the spaces in between. Krista Tippett interviews Irish poet, Michael Longley, on The Vitality of Ordinary Things. It resonates deeply within me, having only just, for the very first time, stopped to witness how the leaves of the old Black Oak, on this very day, were tiny and pink, like a thousand newborn babies hanging from its branches. In contemplation of letting go I've become so much more aware of soaking in every detail of every wakeful hour. There's a humbling compassion and kindness in paying attention. Here's one stanza from the poem, Kindness, by Naomi Shihab Nye. Maybe you will decide to carry it inside your pocket. Leslie Lyman's, "returning to the magic of candlelight, from a page in her journal. A new project for her are these exquisite handsewn images of children's dresses filled with delicate and inquiring objects. Leslie is an artist who explores time, memory and imagination by focusing in on the things people have left behind such as clothing, letters, photograhs and books. Her journals are handmade using coptic stiching to bind her individually tea-stained signatures. After 22 years, we're moving from our farmhouse. It caught us off guard, with the sale of our home happening much more quickly than we anticipated. I'm not sure how I'm doing. I may not know until we drive away for the last time. I'm pausing more than ever. I feel like a human movie camera desperate to record every possible moment and memory I can. This was our last spring to watch the turning of the dormant fields, right before our eyes, into a lush rolling landscape of vibrant green, and our backyard Elm's new buds into young and malleable leaves, linked to the maturing of our fledgling young children into adults. As I purposefully clean out closets and drawers I have discovered a relief in letting things go. Old letters and words have comforted me by how lovingly we expressed ourselves and communicated with one another. Our love and values are embedded in so much more than our belongings. The comforting wisdom of words, not the material things reassured me. "Home is where our heart is." Charlie wrote to me from his semester with Kroka expeditions in the fall of 2012, "We rise early, work hard, eat well, and have a lot of fun." I wrote him back wondering, "What more from life could we dream for?" Katrina Kenison from The Gift of an Ordinary Day wrote, "Watching, listening, learning, I begin to feel at ease where I am, come to know the language of the wind, and the daily path of the summer sun, the proximity of the stars." In this short you tube Katrina reads a chapter from her book about the simpe memories that came and went and what a gift the ordianry days are. The ordinary days and our families and love and values will always go with us. A very talented and inspiring friend, Kim Allsopp, has been passionately creating beautiful work in a local ceramic studio. These enchanting animals perched atop grassy bases are some of her more recent pieces. My winged dog, that Kim made for me, sits on my desk, and reminds me of our beloved dog George, who was taken from us far too prematurely in his life. We met at Castle Hill on Tuesday, May 8th, which also happened to be National Coconut Cream Pie Day! I was hoping to discover that it was National Tulip day because we specifically went there to paint tulips. The round rose garden was filled with every color imaginable. Huge thanks to Camilla and Nonie for encouraging us to gather up our journals and paints and head over to the castle Hill gardens. Below is a sample of the variety of TUESDAYS creative work. My new hibiscus plants will travel with me when we move. Robin Sears paints beautiful flowers and gardens, and sweet animals that are detailed with layers of paints to create the realistic textures. Elizabeth West comments on her ocean painting as being a work in progress, but the colors of the water, with the clouds overhead, the softness of the dunes, and the shadows cast by the white umbrellas has a simplicity and calmness as is. Katrina Hart repurposes old items into jewelry. Below is a necklace she made using old credit cards. Susie Wilson paints on the go, sharing recent creations from Charleston. Sharing builds and maintains connections. Those will go with us. Danny Gregory's Sketchbook Skool blog has good information. The most recent post, titled "You Are Not Alone" wonders whether solitude is really the key to creativity. Check out the website for www.Susanahhowland.com. She is an artist and friend of Nonie’s, and her work is beautiful. When discussing learning about perspective in drawing, Susanah suggested the online learning forum called Skill Share. I came down the stairs this morning to my son, Amory, painting with watercolors at our kitchen table, so I poured myself a cup of coffee and joined him. The birds were out in full force, defying the bitter cold, darting betwixt the Elm branches and the fully-filled feeders. Resilience is critical. This Blue Jay transitioned through several layers, and cups of coffee, from watercolor to collage to acrylic. I just kept going. The birds and Amory were long gone before I put my art supplies away, but a journal entry remains to remind me of a sweet start to a new day. It's 4:45am. This is the first time ever in my life that I've voluntarily gotten out of bed this early without a plane to catch or a sunrise photo to shoot. I'm stuck somewhere between the time zones of Micronesia and New England, nevermind it's Christmas and I'm thinking about the cheeseballs I want to make, the gifts I want to send, the lighted Hope sign I want to hang on our barn. I wish I had time to write a letter to all the people I love in my life, or to paint something for each one of them. 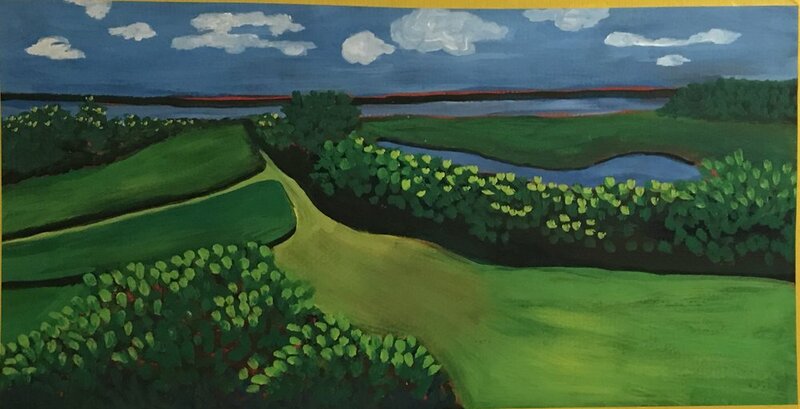 I painted this same scene of Sengekontacket Pond for my daughter, Anna, while visiting her in Palau, the one my daughter, Sarah, had encouraged me to do. It was not only to brighten up her small apartment in Palau, but to leave her with a piece of home. This time I painted it on cardboard from the local hardware store, and we hung it with yellow ducktape over her bed. It comforts me to know that the same image is hanging over both of my daughters' beds. It connects us. Anna's day is winding down. In Palau the sun has set, and here in new England it hasn't yet risen. I won't be able to reach out to everyone I love this season in the meaningful way I'd like, but I will make time to be grateful and to remember that Christmas is a difficult time for many people, so I'll smile at strangers and look for the way that a stranger smiles back", as author Laura Munson so beautifully wrote. The wonder is in the "little things, the in-between moments, the pauses." If only the closet door of a daughter, who is no longer living at home, could tell stories, I would love to sit and listen , and allow the sentimental journey to make me laugh and cry. It's so great how such an ordinary object can summon such tender thinking and fill a day with love. I’m so predictable, that after a weekend of excessive socializing, steady eating and drinking, listening and laughing, planning and moving, I crave a quiet moment to draw. I take my journal, a micron pen and my watercolors, and go for a walk along the neighborhood streets. I stop to take off my socks, in the warm morning sun, smiling at the worker on a coffee break. Continuing straight, I look down the narrow alleyways which arouse a feeling of a secrecy, hidden passageways calling to be explored, but I pass them by, knowing that I will find the window boxes in the direct sunlight of the wider streets. I think I want to draw them and capture their alluring charm, but I don’t stop. It’s not the window boxes. It’s more than that. Clarity is hard. So many small thoughts become impossible to piece together. Why try? Isn’t it enough to revel in a quiet mind without translation? We’re heading back north this afternoon. Good-bye Water Street doorways and Charleston sunshine. We’ll be back. March 27 Writing Prompt: "location, location, location"
I walked up Sagamore Hill with Sammy the other misty evening, and demanded him to sit on the mound of rocks at the very top so I could photograph him. He was king of the hill for that moment. I had almost allowed the grey-veiled day to keep us concealed within the walls of our dry and warm house, but looking over at Sammy, in his crate, I saw my own apathy mirrored in his passive body language. I knew it was time to redirect our early evening. Across the field and up through the woods we went, Sammy with his nose to the ground. Together we climbed. As we reached the top, the silhouette of the trees through the mist calmed me. I breathed in the quiet stillness of the air and felt at peace. The last time we had been here was in a blizzard. Tomorrow there could very well be a blue sky and songbirds singing, and we may even be able to see all the way to the ocean. Location, location, location. We had an awesome group of ladies around the table Tuesday, even a couple of new faces, and everyone was able to emotionally stir us, with one form or another of creative inspiration; poetry, travel journals, drawings of dreams, movies, books and a story about the discovery of stacks of hat boxes and clothing in an historical building. We made a more organized effort to share. Thank-you to everyone! Katrina arrived with some of her stunning travel journals and beautiful poetry. It was captivating listening to her read her poetry, and taking the time to slowly absorb the pages of her journals. Many of us have different journals for different tasks; morning pages, travel logs, sketches, poetry, bullet journaling, writing. How do we condense our work and pages, and what do we do with the personal writing that we wouldn't want anyone to read? I put everything into my one current journal; drawings, thoughts, grocery lists, photographs, business cards, and occasionally words I wouldn’t want anyone else to read. Here is a technique for how I create black out poetry from my stream of consciousness "get it off my chest” writing. There were two separate internal conflicts I wrote about following the loss of my beloved mom. They were written to liberate my emotions, not meant for anyone else to read, so I blackened out most of the words leaving only certain selected ones I chose to expose. This is what I came up with: "Sitting, I remember mom. I hear her breath. Mom's childhood voiced deep experiences. I needed to collapse into them. Time alone is our friend. I sat quietly with mom." The found words in black-out poetry are such a simple way of preventing ourselves from adding in all the extra fluff. Kim created the following black-out piece from a paragraph she wrote responding to the prompt…"but something interrupted me” . Tyler Knott Gregson has a new book of poetry, Wildly into the Dark, Typewriter Poems and the Rattlings of a Curious Mind. The poem below is from his new book and reminded me of a conversation we had about writing. Elizabeth, showed us these lovely watercolors of hers that she had printed up onto cards. They make such wonderful gifts. She also gave me the book, Daily Rituals, a compilation, by Mason Currey, of writers, composers, painters, choreographers, playwrights, poets, philosophers, sculptors, filmmakers, and scientists on how they create. This book has been on my wish list! Thank-you Mason, and thank-you Elizabeth! Kim suggested revisiting Maira Kalman, whose daily ritual is perhaps one we can all relate to. Leslie is preparing for another art exhibition, in June, at the North Hampton Historical Society. Leslie is an historical anthropologist who is passionate about old photos and clothing and letters. All her creations have an ethereal quality to them, bringing bits of the past into our present day. The image below is from a page of her tea-stained journal. She has taken an old photograph and been experimenting with a variety of ways to make changes to it. Her papers and boxes and small journals and drawings are a delight to the eye. Heidi and I went to the Cabot Cinema yesterday and saw a beautiful Turkish movie called Kedi,Cats in Istanbul. I fully understand that not everyone likes cats, but the cinema photography is stunning, and the relationship between Istanbul and its cats is lovely. Watch the trailer, either way, and make your own decision. Perhaps I was feeling especially sentimental having just put our old cat, Romeo down. We talked about so much more. Katrina mentioned Mary Ann Moss and her online drawing course, The Art of Making and Keeping a Sketchbook, and another online class by Pam Garrison, Painting Petals. We talked about blogs and books and movies and the Morgan Museum where there is an upcoming exhibit in June on Thoreau and his journals. We briefly talked about Danielle Smith watercolor paints and the Moth Stories. Lots of good stuff! I went to visit a friend, Meredith, in her Beverly, Porter Mills studio this afternoon. It was so much fun to see Meredith in her creative space, with her adorable Jack Russell, Ivy. Now I need to get outside with Sammy for a walk to see that blue sky from the top of Sagamore Hill before the next snowstorm arrives! There was a blue sky and we were even able to see all the way to the ocean! "LET US GO FORTH TOGETHER"
Another snowy morning and it was a challenge to get out of bed, especially with Henry cozied up at my feet. Last week we had another successful gathering, devoted to making journals and accordion books. Sandy arrived at noon with a big pot of Mulligatawny Soup that was so so good. Thank-you Sandy! Such a thoughtful and generous gesture. I made a big batch on Saturday that received unusually high praises from Ollie. Perfect meal for this weather with a side salad and bread. Sandy worked on an accordion book and journal for her husband, who’s 60th birthday is approaching soon. We had lots of papers spread out all over the kitchen table. Susie and I were both making accordion books for our daughters, and Shelagh worked on making a new journal. I’m looking forward to everyone coming back tomorrow and hopefully we can finish our projects, and get our new journals bound. The binding we have used in the past is the Coptic Binding. It not only looks nice, but it allows the book to open up and lay flat. The link I provided has wonderful step-by-step instructions and photos. Please let me know if you’d like to come early again tomorrow to work on your books! I will be here from noon on. We were talking about letters and I know some of you were interested in the custom stamps I have ordered from Zazzle. You can take any photo or drawing and have it made into a stamp. I just ordered some with a painting of a cow i had done years back. It is such fun to embellish your envelopes with art. And don’t forget about the stationary company, Felix Doolittle. Read about Felix Fu founder of this exquisite stationary company. His studio, as well as a separate retail store called "The Paper Mouse”, is located in West Newton, MA. I spoke with someone from the studio this morning, inquiring if we might schedule a visit and tour of the studio. We can watch the weather and discuss some dates. Kim also brought back a drawing pencil, sitting below in my basket of ribbons, inscribed with the Picasso quote, “Rien n'est plus difficile u’un trait”. "NOTHING IS MORE DIFFICULT THAN A LINE"
There will be no journal gathering on Tuesday, February 21st. Murmuration refers to the phenomenon that results when hundreds, sometimes thousands, of starlings fly in swooping, intricately coordinated patterns through the sky. They have a remarkable ability to maintain cohesion as a group in highly uncertain environments and with limited, noisy information. Starlings pay attention to a fixed number of their neighbors in the flock, regardless of flock density - seven to be exact. When uncertainty in sensing is present, interacting with six or seven neighbors optimizes the balance between group cohesiveness and individual effort. In following the role of seven, the birds are part of a dynamic system in which the parts combine to make a whole with emergent properties, and a murmuration results. Starlings are essentially an invasive species in this country. They were famously introduced to North America at New York City’s Central Park in the 1890s by Shakespeare enthusiasts who wanted all the bird species ever mentioned by Shakespeare to inhabit this continent. 200 million of these birds now inhabit North America. They are not welcomed by everyone and resented for their abundance and aggressiveness, and even called a menace. This murmuration video by world life photographer Dylan Winter gives me chills, and invites us to view the starlings with fresh eyes. "Gone to the Fields to be Lovely"
I’m changing the time of our journaling group to Tuesdays 2:30-4:30, beginning this week on Tuesday January 31st. I will be making myself a new journal before class, so if anyone wants to join me a couple of hours early please let me know, and I will have the supplies ready. I’m including a variety of links in this review, each of which reflects on the universal theme of beauty and resilience. Hope is out there. “We are part of a movement that is greater and deeper and broader than we ourselves know or can know.” -Hawken. Just recently my siblings and I spent a couple of days going through my mom’s belongings…a sentimental journey so many of you have already traveled. Old memories and new discoveries that take time and attention. In looking at Carol Maguire’s website, I discovered that she is teaching a three day workshop at the Creative Arts Center in Chatham this summer from June 14-16, 2017. Each morning she will begin with a demonstration, and then we will paint from a variety of still lives she has arranged. I signed up for the workshop, which still has plenty of available space. The Arts Center is open Monday through Friday, so if you’re interested call them for details, and we can go together. We briefly talked about The North Bennet Street School, and their large selection of continuing education classes . Leslie and Camilla compared bullet journals. You can follow this link and watch the 4 minute video. I still haven’t fully grasped the concept, but it’s very interesting. They incorporate an index, which would be very useful as I am often struggling to find specific entries in my older journals. I may begin to number my pages, and try to make a table of contents for each of my journals. Thanks to Leslie and Camilla I am now officially signed up for Amazon’s Audible Books. I have just started listening to Blessed Unrest by Paul Hawken. If you haven’t seen this yet, watch this touching Michael Jackson Tribute, Heal the World music video, sung by children. Here is one of Parker Palmer's favorite poems by Lynn Unger, titled Camas Lilies. It was posted in today's “On Being" : Parker writes: “ I take my work seriously, and I’m sure you do, too. But at age 75, I’m trying to learn (or relearn) that, in the end, what matters most is not my ability to “produce” but my ability to love…"
The full Bloom of the Camas Lilies occurs during the last two weeks of May. Something to add to our bullet journals in planning for future trips. "Oh summer has clothed the earth In a cloak from the loom of the sun! And a mantle, too, of the skies' soft blue, And a belt where the river runs." Once again I will be on the move, this time back to our Moffett way home, where the summer air has been so lovely and clear, and where linens on a clothesline inspire me, under the shade and comfort of great black oaks, and where I am never too far from the sound of the whispering breezes, gently playing the chimes. Music is everywhere, on porches and under tabernacles, inside churches, circling beach bonfires, blasting out of car windows, congregated at farmers' markets, it plays on. And if we turn it off and simply open our windows, on a bright summer day, our own nature's symphony will fill our ears. "To go house hunting is to dwell in possibility. But what is that possibility? One is that we'll be a new person in a new home. Given a fresh start our better selves will rise. That's part of the answer. But the real possibility we seek is habit; it's the ordinary. Give us room for tumult and quiet, for solitude and passing the time with friends. Give us room for ordinary pleasures, for a day well lived." Hanging my clothes to dry in the warm summer air inspires creative possibilities for a clothesline series, or better yet fills my ordinary moment with an ordinary pleasure. "Why should beauty emerge from the world of the ordinary? The answer is ultimately beacuse the world is natural." It felt so so great to have everyone back around the table for our first 2016 gathering. A bundle of inspiring conversations and ideas were shared this week! For the next few months I’d like to try changing our journal gatherings from Wednesdays to Tuesdays from 2-4. I really hope this will work for most of you. Could you let me know as soon as possible because I don’t want to loose any of our regular group. Camilla and I discussed planning the following week, Tuesday, January 19th to be an evening gathering at The Castle Hill Inn from 4-6. Please confirm this, as well, so we can plan ahead for some wine and hors d'oeuvres! Feel free to bring any newcomers interested in seeing what our group is all about. Meredith showed us her awesome journal with all her collage work, and told us about Kara Bullock’s new online faces and portraits course. Check it out. It goes on all year. I’m considering signing on as it seems to be a very fair price ($125), and a good way for me to get the discipline I need to explore new styles. Danny Gregory is starting a new online class, as well, called Expressing which begins on January 15th. Portraits seem to be the buzz right now. I received the weekly journal review from Sandy Bernat, a very talented paper artist on Marthas Vineyard, who hosts a group like ours, and their focus was on portraits. They were discussing the artist Amadeus Clemente Modigliani(1884-1920). His portraits were known for their elongated forms, linear qualities and earthy tones. 1.Beginning with a pencil, draw a U-shaped curved line in the middle of your paper. 3.Draw almond-shaped eyes and an L-shaped or U-shaped nose. 5.Draw two lines for the neck(if you are close to the bottom of the page extend the lines off the page). Add shoulders and a collar. 6.Add several lines in the background to place your figure in an environment. They only need to suggest windows, doors and the like. 7.Paint with watercolors and use lots of water and work in layers. Kim spoke to us about an artist who inspired her with an awareness of collecting images from out of magazines or from photographs or anywhere…as a way to awaken ourselves to the kinds of things that catch our eye and spur our emotions and creativity. Kim suggested the possibilities of recreating our images into our journals but in an abstract way. The simple drawings can become remembrances of moments that caught our attention. Thanks Kim for always bringing your thoughtful and inquiring discoveries to our attention! Remain aware of what moves you tho next week, and either make a list of the things, or if you have time create symbolic drawings in your journal. Keep creating and filling your journals !!! it's all the same-and love it all you can. that feels like the world's heart since time began. too late to quibble now, you're in too deep. We're on again for tomorrow from 2-4. Last week Camilla Eagan joined us, and she and Kim and I painted pears. Camilla glued her pear onto the cover of her new journal. While drawing and talking as we like to do, Camilla and Kim mentioned an article in the globe about a newly published Sketchbook Project book. There is a The Sketchbook Project Library that began in Atlanta in 2006, and moved to Brooklyn in 2009. It has grown from a small organization into a worldwide community of over 70,000 artists. Maybe sometime we can organize a trip to Brooklyn to visit the museum. There was a good article written up about the book in the Austin Chronicle. Hopefully it will arrive at my house tomorrow in time for you to look through it and be inspired. Kim recently participated in a two day "Expressive paintings from photos workshop" with Nancy Colella. She is going to share some of Nancy's techniques with us tomorrow. It involves photographs with simple subject matter, bright colors and shadows. If you have any photos with those characteristics bring them with you tomorrow. I will have some photos here as well. I attached Kim's photograph of pears beside her completed painting below. Pears seem to be a popular theme. In looking above at the Sketchbook Project site, another thought for tomorrow is to glue a section of a newspaper article into your journal, and we can paint over them with Gouache. Gouache is an opaque watercolor so it is thicker and more vibrant. I am attaching a link to a section of the latest Brain Pickings Weekly entitled Nine Podcasts for a Fuller Life. It has a most wonderful and beautiful podcast, interviewing Mary Oliver, on being. If you haven't subscribed to Brain Pickings, I highly recommend you do so, but be prepared to get lost in all the many directions it will lure you off into. Hope you guys can make it tomorrow from 2-4. I'm thinking of extending the time from 1-4. Let me know what you think. I haven't been very productive myself this week, although I did make a new journal since I only have two pages to go in my recent one. What a beautifully perfect morning. I finally got to bed at a decent hour last night, allowing me to be fully awake at this early hour. We had a good group yesterday, always something for me to look forward to. Kim was back from France and had some great photos as well as drawings to show us. She saw an exhibit of exquisite book art while in Chartres, which got us on to the discussion of what exactly book art is. Elizabeth decided to make an accordion book for her daughter's graduation, so I helped her with that. Kim had made a lovely little one for her daughter. If anyone else is interested, I am always happy to help make those. They are quick and make really nice gifts. I attached a photo of the outside of one i had made for Charlie's birthday one year. They can open up to as many folds as you need for photos or drawings, and on the back you can write a note to whoever it is for. Leslie was still interested in a watercolor demonstration, so I took advantage of the lovely card Susie brought with the peony watercolor on it, and attempted to show how I would go about applying and blending the paints. Hope that was somewhat helpful. It is actually a wonderful image to practice on so maybe we can all try it next week. Express Yourself has theirannual show tonight at the Wang, amazingly inspiring and upbeat and FREE. It starts at 7 and is open seating. Look at their site to see how young people's lives can be powerfully changed with art. Have a wonderful day! And thank-you for supporting my journaling. It is so nice to be able to have this weekly time with you guys! During my two days in Burlington, I stopped into a large communal gathering spot to get a coffee, and I noticed beautiful poems, written by teenagers, encircling the room. They were collected through an organization called "The Young Writers Project" founded by Geoffrey Gevalt. I attached two links. The first one is to a beautiful short memoir written on Thanksgiving day 1995, by Geoffrey, about his daughter, Lily. I highly recommend you to watch it, and the second is the link to an overview of The Young Writers Project. Enjoy. Envelopes and the mysteries of all the possibilites of what the letters inside could be seems to be a recent theme. Some of us attached envelopes to the inside of our journals. Others decorated envelopes with drawings and pretty stamps to be mailed off to someone they love. I have The Griffin & Sabine Trilogy a beautiful series of stories told through decorated letters and postcards that I will show you next week. Elizabeth brought me a lovely book called The Art of Stillness by Pico Iyer. Thank-you Elizabeth!
" Sitting still is a way of falling in love with the world and everything in it; Going nowhere as a way of cutting through the noise and finding fresh time and energy to share with others." I showed a short video that gave a crosshatching demonstration, and will have a handout on that for next week. I am panning on showing a watercolor video next week because I know many of you are interested in doing more of that. The Handbook Journal Company makes a wonderful watercolor journal that comes in a few different sizes for those of you who want to focus on doing watercolors. I discovered an illustrator named Jess Polanshek, owner of a small illustration business called Polanshek of the Hills Illustration. Check them out. I purchased a book of hers called The Quilted Forest and decorated an envelope for my mom for mothers day with some of her illustrations. They combine pen and ink and patterns and nature and lovely colors. I attched a photo of my envelope which I am now off to mail. Summers wind down, the air has changed, and I pause, before driving away, to embrace a spontaneous moment. Warm interiors and the gradual layering of clothes will begin to replace porches and bare feet, but the music will linger on in my heart, and the passages of time will continue to strengthen my love. Seastone Papers : Inside of Sandy Bernat's studio in West Tisbury, on Marthas Vineyard, is where I've spent my last three mornings. This is one of my completed projects. If you had ever asked me whether or not I had any interest in making paper, I would have assuredly said no, but that was before meeting Sandy two Saturdays ago at the Tisbury farmers market, where I first laid eyes on her beautiful coptic bound journals constructed of some of the most exquisite hand made papers I have ever seen. She uses locally harvested fibers and botanicals, as well as cotton rag and hemp. The cover of the book I bought has bits of a hornets nest added, as inclusives, into the pulp. Sandy is both an english teacher and a paper artist. She has traveled to remote areas to study the art of handmade papers. With her papers she creates individual books, each of which is a unique and individual piece of art. The three classes I took were "Monoprinting with a Gel Plate", "Collaged and Printed", and finally "Making Gel-Printed Books". I plan to return for a papermaking sampler class. You can visit Sandy's website, but for a real treat stop by her studio on your next trip to Marthas Vineyard, or maybe even sign up for one of her many classes. I may see you there! Last Wednesday our sketchbook journaling group had a discussion about making time to journal. My only suggestion was to carry your journal and simple supplies along with you at all times. There will almost always be moments throughout your day if you are aware of them. You only need a few minutes here and there. You could try challenging yourself to make one entry a day for a couple of weeks. Make it a habit and making time will come more and more naturally. Personally, I have plenty of time to submit journal entries, but I still don't do it as often as I would like. For me, it's not so much a matter of making time as it is just becoming more impromptu and less concerned about controlling the outcome. Making time starts with being ready for unexpected moments and then diving in. 2. draw something you wear and love. My pages above have a photo of Sammy wearing a new necklace that I made and lost within 24 hours, a drawing of a favorite button bracelet of mine, and some casual gouache reproductions of artists, whose work I like. If anyone is interested in joining us, please send me an email. We meet from 2-4 on Wednesdays. We share ideas on many things and links to artists and quotes and books. Two that I shared this week were Misty Mawn, who has a wonderful creative website, and Maria Popova's brain pickings, which my sister-in-law introduced me to and I now support.